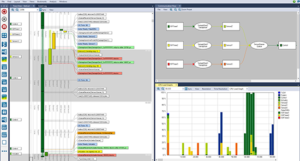 Tracealyzer version 4 is the largest update of Tracealyzer ever, with a lot of new analysis and visualization features that users have been asking for. It has been redesigned from the bottom up, spanning from much faster data processing to a fresh modern user interface with live visualization. Also, it represents a new phase in the development of Tracealyzer as we focus on deeper, more powerful data analysis and simultaneously add new functions to allow users to adapt Tracealyzer analysis to their particular needs. We’ve modernized the user interface and added a window manager that handles both docked and tabbed windows – meaning you can have more information available on-screen. You can have multiple traces open in separate windows and you can save your favorite window layout so that Tracealyzer remembers it between runs. Oh, and let us not forget the brand new, colorful custom-designed icons.